Don't Worry Baby is born of a desire to live more and consume less. 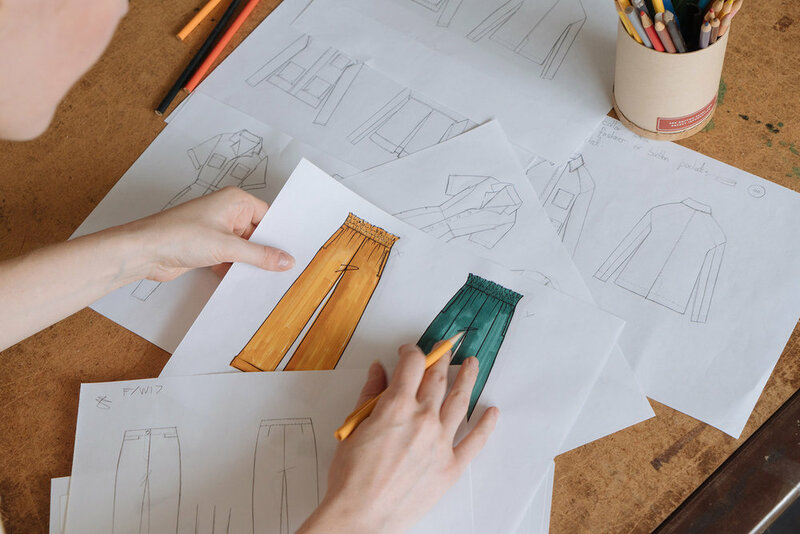 It is an alternative to the fast fashion industry, which, at the expense of human welfare and the environment, is focused on speed and mass consumption. It is a belief in making clothing with personality and clothing that lasts. It is a belief that quality, transparency, and patience can transform the fashion industry. Know the origins of your wardrobe. Consider purchases for more than a moment. Celebrate more, accumulate less, Don’t Worry Baby. We make all of our patterns and samples by hand in our Brooklyn studio. For production, we rely on the experts in NYC’s Garment District. If you see us carrying a roll of fabric on the subway, you know why! We source as much as we can in New York City, transporting locally and reducing our carbon footprint. Transparent, healthy work environments only! We work with production partners in the Garment District who share our values of working skillfully and humanely, on a small-scale. No packing peanuts or plastic here! Our packaging is 100% recyclable, from tissue to Tyvek. We use deadstock and surplus fabrics whenever possible and donate all of our studio scraps to FABSCRAP for recycling. Want to make your clothes last longer? Read our Care tips.